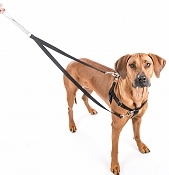 The 2 Hounds Design Freedom No-Pull Dog Harness makes walking your dog easy and enjoyable. Recommended by veterinarians, behaviorists and dog trainers, the training harness is lined with velvet. It is easy to put on and take off. The training package helps stop dog pulling. Available in a variety of bright colors, the harness comes with a leash with 2 connections. All of 2 Hounds Design dog harnesses, collars and leashes are made in the USA. They company is also known for their beautiful custom made designer dog collars and martingales lined in velvet or silk. 2 Hounds Design Freedom Harnesses are available in 5/8" width and 1" width in sizes XS - 2X in a wide variety of bright colors.The harness training package comes with a leash with 2 connections.